At TORQUE – Our trainers not only talk the talk – we walk the walk. We have trainers who specialize in all aspects of fitness – meaning you can be sure that you’ll be working with someone who has experience getting results. Every trainer is professionally certified and has years of experience working with clients. To inquire about working with one of our trainers – call us at 416-642-1010, or email dan@torquebarbell.com. Professional powerlifter and National Record Holder. Certified Sports Conditioning Specialist, Sports Nutritionist & TORQUE Powerlifting Coach. Specializing in – Strength training, powerlifting, sports/athletic performance, body transformations. 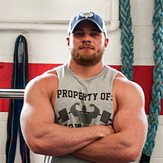 Kris is experienced in strength training, bodyweight training, olympic lifting, and athletic performance. He ensures his clients have variety in their training through strength, flexibility, mobility, abdominal strength, and cardiovascular endurance. This give his clients a well-rounded physique with improved health. Erica is a competitive powerlifter; She placed 2nd at the WPC World Championshps and gold medal at CPF Nationals 2018. She is a powerlifting and strength coach, certified personal trainer, and mental health and mindset specialist with over 13 years in the field. Gina has worked in a variety of different settings from group fitness instructor, to spin classes, and beginner yoga. She has multiple years of experience working with clients and takes a balanced approach to training by incorporating bodyweight exercises with strength training, mobility/ flexibility, and core strength.